Gather your dandelion greens and wash them thouroughly, then drain well. Place your eggs in a pot with cold water and bring to a boil. Cook them for about 10 minutes, until hard-boiled. Drain and cool, then peel and slice. In a pan, heat a teaspoon of oil and place your bacon strips. Gently fry them on both sides for a couple of minutes. Remove from pan and place on a paper-towel lined plate to drain. Wash and dry your radish, then slice thinly. 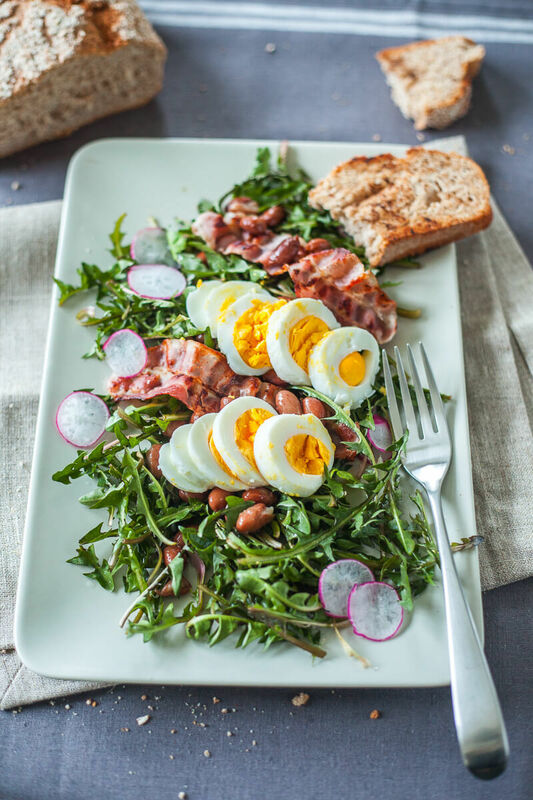 Combine your salad: in a bowl, place your dandelion greens, add egg and radish slices and top with bacon. Add drained canned beans. Salt and pepper to taste and dress with oil and vinegar to your liking. Serve with a slice of toasted rye bread. Enjoy!